Meet some of the water protectors who are determined to keep the fight going beyond Standing Rock in the premiere of this new short film. On Thursday, the effort to stave off the pipeline at Standing Rock came to an end with more than 40 arrests and a smattering of burning campsites, small blazes started by holdouts. The movement of water protectors that has been occupying treaty lands in North Dakota demonstrated that for the Great Sioux Nation—as well as the many native and non-native allies that joined them—struggles for the environment, autonomy, and a new way of life cannot be restricted to reservation boundaries. Since the summer, territories like the Standing Rock Indian Reservation, Morton County, and North Dakota were challenged by the circulation of tens of thousands of people gathering to confront the decimation of their sovereignty and decision-making. These people—as we saw during the weeks we spent at the camps from September to December—came to defend the rights of the water, the rights of the land, and the rights of the seven council fires of the Lakota, Nakota, and Dakota peoples, or Oceti Sakowin. 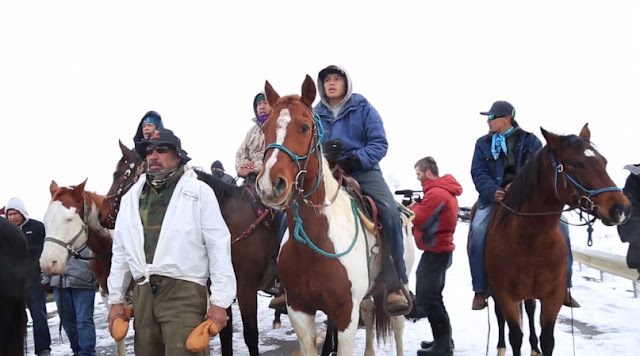 What made Standing Rock distinct was a historical context of both war and prayer, a continuation of the Indian Wars of the 19th century defending tribal sovereignty and a way of life as being one and the same. Standing Rock became an opportunity for people to recreate a life and community not simply in resistance to the construction of a pipeline, but to a whole architecture of an imposed economy of time, subsistence, and human relation. Responses to ""Indian Winter" Documents The End Of Standing Rock And The Determination To Fight On"